Who says you can't have ice cream in the Fall? Ice cream is the perfect complement to a warm apple pie or atop a hot, Fudgey Brownie or served with Chocohotopots. 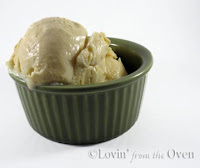 That combination of hot vs. cold is a real treat and you will love this ice cream recipe from David Lebovitz. 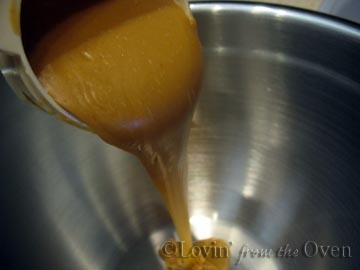 Introducing a new caramel ice cream, one that is so much easier to make and not as rich the Salted Butter Caramel ice cream from the same creator. This starts with 8 oz. of this lovely, creamy, smooth Caramelized White Chocolate. If you've made this and have been keeping it in the fridge, re-warm it in the microwave. In a medium saucepan, heat the milk, sugar, and salt. 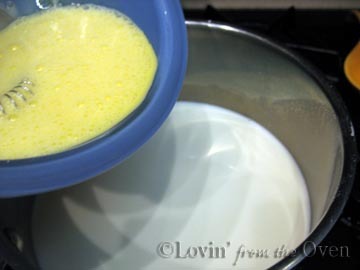 then pour the warmed yolk/milk mixture back into the saucepan. 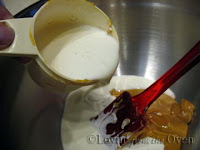 Cook mixture over medium heat, stirring constantly with a spoon, until the mixture thickens and coats the back of the spoon. 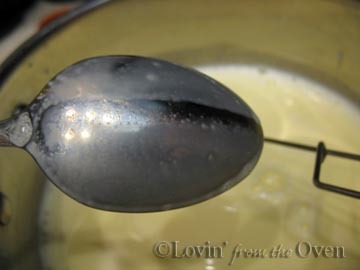 When you can take a finger and draw a clean line down the middle of the spoon, the mixture is ready. 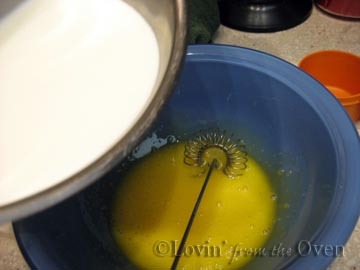 Immediately pour the custard through the strainer (to catch any "scrambled" eggs) into the white chocolate mixture and stir till smooth. 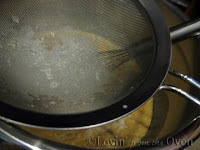 Put contents in a container with a tight fitting lid and refrigerate overnight. Freeze in your ice cream maker according to directions. I'm one that believes ice cream is good year round! This sounds amazing! It's definitely time for me to pull that Kitchen Aid ice cream bowl out of the freezer and give this recipe a try. I haven't made ice cream for months.